While Franken may have surprised people at first with his effectiveness in office, he’s become a trenchant and high-profile force in the Senate since his 2009 election. (Just ask Jeff Sessions, Betsy DeVos, or any number of other Trump minions who’ve been exposed by Franken in front of the unforgiving C-SPAN cameras this year.) Taking on the Republicans’ recent failure to repeal Obamacare (“Every plan they came up with was terrible.”), old nemesis Bill O’Reilly (“He didn’t understand that satire is protected speech even if the object of the satire doesn’t get it.”), the Trump nightmare, and his unlikely friendships with his more conservative senate cohorts, Franken also showed off his much improved “pivoting” skills, as he expertly dodged Colbert’s inevitable question about a rumored 2020 presidential run. 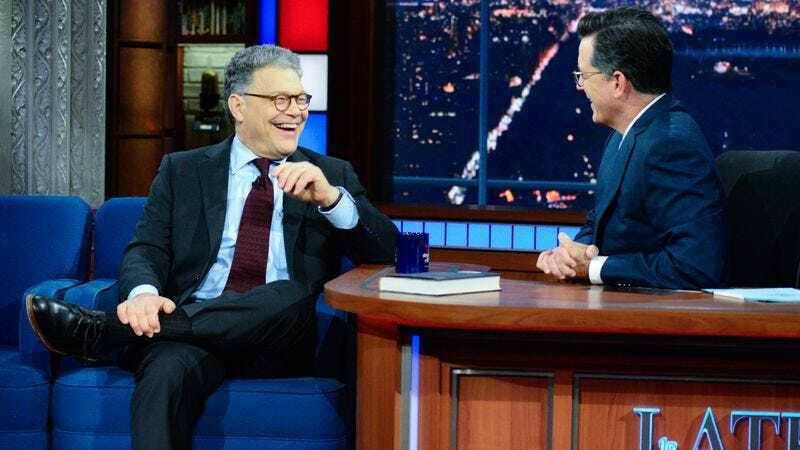 As far as former TV personalities turned unlikely political figures go, the prospect of President Al Franken, in Franken’s eminently sensible and amusing appearance here, came off much preferable to, say, Senator Kid Rock, at any rate. Or something truly insane, like the host of a reality show having the nuclear codes, a premise SNL-era Al Franken would no doubt have rejected for being too fruitlessly silly for even the ten-to-one graveyard spot.